This year, the first patent applications for bicycles were filed. 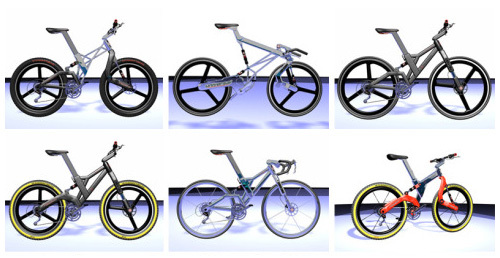 The design makes possible to produce a wide range of bicycle types: road bikes, sport bikes, MTB, trekking, etc. with a range of bicycle frames, handlebars and their size. The bikes are fully suspended with disc brakes and various gearshift systems. Bicycles can be folded in 6 to 12 seconds. The size of the compound bicycle depends on the size of the tire diameter. The road bike on the jigsaws can be folded into a square packet of dimensions 69x69x16 cm, children's size 55x55x20 cm. This patented folding system allows you to handle different shapes of frames, controls and gears. Patents are granted in Australia, Brazil, the Czech Republic, China, India, Japan, Canada, Korea, Hungary, Mexico, Poland, the Russian Federation, Singapore, Vietnam, the US, most European countries are included in the European patent application.